This is your invitation to the Saturday January 19th meeting of The Amateur Mendicant Society of Detroit. It will be held, starting at 6 p.m., at the Commonwealth Club on Dequindre Rd. in Warren, MI. Bev Ellis, 48132 Colony Farm Circle, Plymouth MI 48170-3305. Assigned story: "A Case of Identity." Featured presenter: Liza Potts, of the Sherlockian.net website PLUS a scene from David MacGregor's new play "Sherlock Holmes & The Case of the Fallen Souffle." There will also be a birthday cake for Mr. Holmes, the usual toasts, prizes and more. The annual spring meeting of the Amateur Mendicant Society of Detroit took place on June 23, 2018 in familiar haunts – the British Commonwealth Club of Detroit in the bosky suburb of Warren, Michigan. The society’s Gasogene John Kramb called the meeting to order at 6:44 p.m. and greeted the 50 Sherlockians in attendance. He also introduced the club’s officers and planning committee and welcomed guests, including those who had traveled from such far-flung cities as St. Joseph and Kalamazoo. Mich. and Columbus, Ohio. He then borrowed from the Baker Street Irregulars and quoted from the Holmes’ story “His Last Bow” (“Stand with me here upon the terrace … “) to honor long-standing member Phil Jones who had recently passed away. Jones, a gentle and scholarly man, was known for his encyclopedic knowledge of The Canon and for cataloging over 11,000 Sherlockian pastiches. Former Gasogene Roy Pilot then did the same for the club’s late Tantalus Ray Mandziuk and its late Tide-Waiter Walter Young. Mandziuk in particular had been instrumental in reorganizing the club in 1999 and helping to bring it out of one of its episodic hiatuses. Next on the agenda were the customary toasts, to The Woman (by Regina Stinson), Mrs. Hudson (Michael Ellis), Mycroft Holmes (Bev Sobolewski) and Watson’s Second Wife (Chris Music). Glenn Walters also added a salutation for a character who only appears once in the Canon but without whose efforts we would know little (or nothing) of Holmes – that being Murray, the orderly of Dr. John Watson, who fortunately evacuated him back between British lines after Watson was wounded by a jezail bullet at the Battle of Maiwand during the Second Anglo-Afghan War in 1880. Glasses drained, the assembly then settled down to a fine dinner of chicken Kiev, ginger pork, a summer salad and the accompaniments. With the room soon sated, Chris Jeryan walked the crowd through the talking points of the night’s story, “The Adventure of the Six Napoleons,” which started with what looked like a case of simple vandalism but actually involved a jewel heist, the Mafia and murder. As a curious sidelight, Pilot then explained that he had in his collection a letter from Arthur Conan Doyle, who had served as Watson’s literary agent. 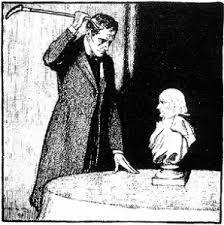 The letter discussed how Doyle had invested in a machine that made exact copies of small sculptures – just a few months before he wrote “The Six Napoleons,” a tale that revolved around duplicate copies of busts of the late French emperor. There was also an attempt to show a brief film clip of “The Six Napoleons” from the Jeremy Brett-as-Sherlock TV series but alas, the sound system briefly failed, no doubt through the evil efforts of one of the late Prof. Moriarty’s minions. Fortunately, the evening was saved thanks to a stellar presentation by Brad Schwartz entitled “The Great Detectives: How Sherlock Holmes Inspired Eliot Ness.” Schwartz, whose book on Ness and Al Capone, (“Scarface and the Untouchable”) is coming out in August, also offered a toast – to his father Denny, whose birthday was the following day and who had introduced him to the tales of the original Great Detective years ago. Among the fascinating revelations in his presentation, he detailed the G-man’s childhood love of the Holmes’ adventures, more than half of which were first published during Ness’ formative years. 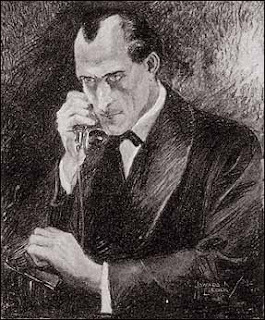 And he concluded that while both Holmes and Ness represented new kinds of detectives, while Capone could reasonably be considered a 1920s Chicago version of the London crime boss Moriarty. Gasogene Kramb also told the crowd that the next meeting of the Mendicants would be in late September/early October at the Polish-American Cultural Center in Troy. Watch for details in late August or early September. As the evening was winding down, it was time to do the drawing for this meeting’s door prizes, which included proof copies of Brad’s book (“Scarface and the Untouchable: Al Capone, Eliot Ness and the Battle for Chicago”), an English tea set, a Sherlockian puzzle case and a Baker Street book. The winners included Bobbi Gorevitz, Michael Locke, Dan Pilot, Brigit Locke, Douglas Bianchi and Sam Stinson. Then, Anne Musial and Patience Nauta led the group in the traditional singing of “God Save the Queen,” Tantalus Rob Musial recited the poem “221B” and Kramb gaveled the meeting to a close at 9:37 p.m. The annual winter meeting of the Amateur Mendicant Society of Detroit occurred on January 6, 2018 – which was also the 164th anniversary of the birthday of Mr. Sherlock Holmes. The venue was the Society’s traditional home, the British Commonwealth Club of Detroit in suburban Warren, Michigan. Gasogene John Kramb called the meeting to order at 6:42 p.m. and greeted the 52 members and guests, among them Taylor Card, welcoming all and introducing the club’s planning committee. Receiving a special welcome was David Mandziuk, attending in honor of his late father, Ray, one of the reorganizers who brought the society back from its somnambulant hiatus in 1999. Borrowing a page from the Baker Street Journal, Kramb quoted from the final Holmesian adventure “His Last Bow” in which Holmes bids goodbye, saying “Stand with me here upon the terrace…” and which the Journal uses to note prominent Sherlockians who have recently passed away. Remembered in the moment of silence besides Ray Mandziuk were Mendicants Thomas Dobbke, Walter Young and Larry Katkowsky as well as longtime Commonwealth Club volunteer and hostess Bessie Smith. The traditional toasts were also offered up, with The Woman being saluted by Al Calderini; Mrs. Hudson being honored in a call-and-response by Scott Monty, Mycroft Holmes being toasted by Christine Jeryan and Watson’s Second Wife as saluted by Rob Musial. There was also the traditional extra toast offered by Jerry Alvin, this time in memory of the composer Vivaldi, nicknamed “the red priest,” which of course recalled Ezekiah Hopkins, the late millionaire from Lebanon, Pennsylvania who so bountifully provided for the Red-Headed League. Then Kramb made a special presentation, a framed certificate of appreciation (complete with an English tuppence) for salutary service to the society’s Tantalus, Rob Musial. Though surprised, Musial was able to offer the final toast, which explained the convoluted and some would say spurious scholarship that led to January 6th being recognized as Holmes’ birthday, though his biographer Dr. Watson or Watson’s literary agent Arthur Conan Doyle, never provided the actual date. After the Twelfth Night repast which included rib-eye roast, roast chicken, green beans, roasted potatoes, salad, and desserts, highlighted by a specially-prepared sumptuous Sherlockian birthday cake from the Chocolate Bar Café in Grosse Pointe Woods, the evening continued. Next, guest and playwright David McGregor noted two upcoming Sherlockian stage plays of note, the world premiere of his work, “Sherlock Holmes and the Adventure of the Elusive Ear,” at the Purple Rose Theatre in Chelsea, Michigan from March 29 through May 26 – and “The Hound of the Baskervilles,” at the Shaw Festival at Niagara-on-the-Lake, Ontario, August 1 through October 27. Quizmaster Michael Ellis then queried the assembly on their knowledge of the evening’s story, “The Adventure of the Abbey Grange,” with Chris Jeryan scoring the winning total. The main course was the evening’s presentation, “Sherlock Holmes: January’s Child,” by Mendicant Michael Jones. This scholarly paper took a deep dive into Holmes’ personality, investigating if, by today’s standards, the Great Detective could be considered a manic depressive, someone with bi-polar condition, a high-functioning sociopath (as Benedict Cumberbatch proclaims the character to be in the popular BBC show “Sherlock”) or perhaps someone with Asperger’s Syndrome. Whatever the diagnosis, Jones concluded that Holmes’ sometimes eccentric and odd behavior also helped make him a force for good and someone to be admired. With the presentation concluded, Kramb revealed that the Society’s next meeting would be in June, with a presentation by Brad Schwartz that investigates the possible connections between Holmes’ and the 1930s crime-fighter Elliot Ness. More details will be forthcoming. As the meeting drew to a close, Anne Musial and Gayle Conway led the multitude in the traditional singing of “God Save the Queen;” Rob Musial offered the traditional closing poem, “221B” by Vincent Starrett and Kramb gaveled the meeting to a close at 9:02 p.m.
And we sincerely hope that after the holidays, you’ll be in the best condition to join us at the annual winter dinner meeting of The Amateur Mendicant Society of Detroit. Our assigned story and brief discussion is on “The Adventure of the Abbey Grange,” which concerns an abused woman, a vicious murder and a detective who bends the law. 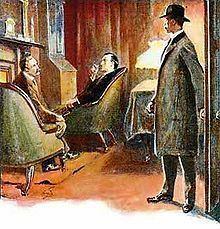 There will also be toasts, a prize raffle and a celebration of the 164th birthday of Mr. Sherlock Holmes. Members may also bring their Sherlockian memorabilia to sell and/or swap. Your entrées include rib-eye roast, roast chicken, green beans, roasted potatoes, salad, and desserts including a piece of birthday cake. As always, there will also be a cash bar. The annual fall meeting of the Amateur Mendicant Society of Detroit took place October 1, 2017 at the Station 885 restaurant in Plymouth, Michigan with 33 members and guests enjoying an afternoon of Sherlockian fellowship. Gasogene John Kramb gaveled the meeting to order at 2:08 p.m., welcoming all and introducing the society’s board. He also noted that two of the society’s past gasogenes, Ed Stein and Tom Voss, were in attendance. There was also a moment of silence for two recently departed longtime members, Walter Young, a board member for more than 15 years and Ray Mandziuk, who with Roy Pilot, brought the society out of hiatus more than 17 years ago. Also introduced was Doug Bianchi, who first indicated an interest in the group back in 1987 but whose query was apparently intercepted and purposely mislaid by one of Professor Moriarty’s minions. Other guests included Tamara Christie and Kelly Aydlott of Royal Oak Briars ???? ?, which crafts custom hand-made pipes and displayed several at the meeting. Next, the society’s traditional toasts were offered up, with Bev Sobolewski saluting “The Woman,” Al Calderini honoring Mrs. Hudson, Commissionaire Chris Music toasting Mycroft Holmes and Chris Jeryan calling on the assembly to hoist their glasses to Watson’s Second Wife. Speaking of Mrs. Hudson, the restaurant served up a hearty afternoon meal of roast turkey with gravy, baked salmon and all the usual accompaniments topped by a dessert of white chocolate mousse. Gasogene Kramb then went over the significant points of the assigned story, “The Adventure of the Three Garridebs,” noting among other things, its resemblance to at least two other Canonical tales. Then, publisher George Vanderburgh dished up the afternoon’s main course, a presentation on the book covers and internal art for the Battered Silicon Dispatch Box. Among the highlights were drawings of Holmes as a marionette operated by Arthur Conan Doyle and a constellation of stars forming an interstellar Holmes pictured with the U.S.S. Enterprise of “Star Trek” fame. The society’s Tantalus Rob Musial then took a minute to update the assembly about two recent Sherlockian developments, the recent publication of “From Holmes to Sherlock: The Story of the Men and Women Who Created an Icon” by Mattias Bostrom and the world premiere of a rousing new play, “Sherlock Holmes and the Adventure of The Elusive Ear” coming to the Purple Rose Theatre in Chelsea, Michigan. The play, which features Holmes and Vincent Van Gogh in a most unusual case, runs from March 29 to May 26, 2018 and the AMS is considering a group outing to see it. In an unplanned and welcome surprise, the playwright, David MacGregor, was in attendance to offer a brief preview of the work. As the meeting wound down, Musial then did the drawing for the door prizes, with MacGregor taking home (what else?) a Sherlock Holmes book, Bobbie Gorevitz scoring a Sherlock Holmes scarf and Kramb being awarded a Moriarty coffee mug. Kramb also announced that the next meeting of the society would be at the Commonwealth Club in Warren on January 6, 2018 -- the same date as the actual 164th birthday of Mr. Holmes. In the meeting’s finale, Anne Musial led the multitude in the singing of “God Save the Queen,” Music recited the traditional closing poem “221B” by Vincent Starrett and Kramb adjourned the proceedings at 4:28 p.m. The annual spring meeting of the Amateur Mendicant Society of Detroit lured 44 erstwhile members and guests to the society’s unofficial home base, the Commonwealth Club, in Warren, Michigan, on June 17, 2017. Commissionaire Chris Music called the evening meeting to order at 6:34 p.m., welcoming the crowd and introducing the society’s board and the first-time guests – and the guest who came the farthest, Mary Miller, from Indianapolis. The traditional toasts were offered with George Vanderburgh (in absentia) saluting The Woman, Rob Musial toasting the long-suffering landlady Mrs. Hudson, Eddie Stein raising a glass to Mycroft, and Bev Ellis saluting Watson’s Second Wife. Which led to the evening’s main event, with a short detour for a tasty repast of ginger pork, chicken Marsala and all the usual fixings. Next, Michael Ellis rose to the podium to offer a brief recap of the “Creeping Man” story. Since it concerned a deluded older man’s affections for a younger woman, Ellis next led the multitude through the evening’s presentation, May-December romances and how they’ve been interpreted both in the Sacred Writings and the great mass of writings that followed Watson’s tales. In the wide-ranging presentation, Ellis touched on gold-diggers, the Fountain of Youth and such romances as seen by Hollywood and songwriters. The highlight was the playing of a recording of “Aunt Clara,” as sung by Sherlockian James Montgomery more than 60 years ago at both Baker Street Irregular meetings and those of the Amateur Mendicants. The multi-versed song concerns an “adventuress” who’s done quite well though the chorus notes that “her picture is turned to the wall,” a chorus that most in attendance were soon giddily singing. Ellis continued his overview with a look at Laurie King’s popular Mary Russell series about a girl who is befriended by an aging Holmes in retirement. He also touched on early 20th Century spurious research into the use of monkey glands, drug use during the Third Reich and actress Emma Watson – though not in that order. Next, commissionaire Music presented the society’s annual Beggar’s Cup award to Anne Musial for her long dedication to the current iteration of the club, from welcoming attendees and producing name tags to obtaining the prizes and running the prize raffles that highlight each meeting. In addition to many other unsung duties, Anne also suggested the Commonwealth Club as a suitable venue for the Mendicants. Then the door prizes were drawn with James O’Keefe winning the Big Book of Holmes’ stories, Eddie Stein taking home the special Life magazine issue on Holmes and Natalie Katkowsky winning the collection of Sherlock DVDs. As the meeting wore down, all in attendance sang the traditional “God Save the Queen” and actor John Sherwood concluded the evening with the reading of the poem “221 B” and the meeting was adjourned at 9:32 p.m.
Addendum: The next meeting of the Mendicants will be Sunday Oct. 1 at Station 855 in Plymouth, MI and the speaker will be George Vanderburgh.